Hyperion is a science fiction novel by the author Dan Simmons. This is the first book that I've read by Dan Simmons, but definitely not the last - actually I've already started on the sequel. 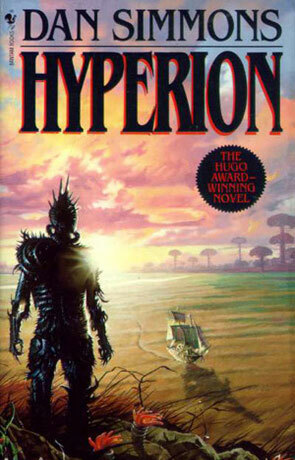 Hyperion is the tale of a bunch of pilgrims, on their way to the Time Tombs on remote planet of Hyperion. Along the way some of the pilgrims get to tell their tale, about why they where chosen to this mission and what the Tombs mean to them. Most of the book consists of these tales. Lets get one thing clear; this novel is a masterpiece! I can fully understand why it won a Hugo Award. Simmons writes in a deep and full language that reads as a dream. His story is very interesting and he manages to weave philosophical and religious subjects into the story without making it stiff and stuffy. This is the stuff that leaves you thinking and wondering long after you have put down the book. The ending leave the question of what the Time Tombs are open, and in that fashion it begs for a sequel, but with the tales of the pilgrims having so much weight in the story, that the book also works fine as a standalone. Written on 25th February 1999 by TC.